The combination of a massive ramp up in financial information combined with our natural inclination to zoom in on negative news is making us worse investors: more fearful, more jittery, more short term. Five ways to help manage the noise and turn down the worry list are: put the latest worry list in context; recognise that shares return more than cash in the long term because they can lose money in the short term; find a process to help filter noise; make a conscious effort not to check your investments so much; look for opportunities that investor worries show up. We are going through one of those periods where it seems there is a long list of things for investors to worry about: the US election; the Fed; ever present fears about a break of the Eurozone; and China. To be sure these risks are real and in our view some combination of them could drive a short term correction in shares, but we don’t see them derailing the longer term rising trend in shares. More fundamentally there seems to be a never ending worry list which is receiving an ever higher prominence as the information age enables the ready and rapid dissemination of news, opinion and noise. The danger is that this is making us all worse investors as we lurch from one worry to the next resulting in ever shorter investment horizons in the process. The trick is how to manage the noise to avoid this. Why the worries might seem more worrying? The problem for investors is that the worry list seems more worrying than it used to be. Yes, there is a fundamental element: the nominal return potential from most asset classes are lower than they used to be, global growth is slower than it was pre GFC and the world seems awash in geopolitical risks. But there is a huge psychological aspect to this that is combining with the increasing availability of information, and intensifying competition amongst various forms of media for clicks, that is magnifying perceptions around various worries. Firstly, people suffer from a behavioural trait that has become known as "loss aversion" in that a loss in financial wealth is felt much more distastefully than the beneficial impact of the same sized gain. This probably reflects the evolution of the human brain in the Pleistocene age when the trick was to avoid being eaten by a sabre toothed tiger or squashed by a wholly mammoth. This leaves us biased to be more risk averse and it also leaves us more predisposed to bad news stories as opposed to good news stories. Flowing from this, prognosticators of gloom are more likely to be revered as deep thinkers than are optimists. As John Stuart Mill noted “I have observed that not the man who hopes when others despair, but the man who despairs when others hope, is admired by a large class of persons as a sage.” In other words bad news and doom and gloom find a more ready market than good news or balanced commentary as it appeals to our instinct to look for risks around the corner. Hence the old saying “bad new sells”. Secondly, we are now exposed to more information than ever on both how our investments are going and everything else. On the one hand this is great - we can check facts, analyse things, sound informed easier than ever. But for the most part we have no way of weighing such information and no time to do so. So it becomes noise. This comes with a cost for investors. If we don't have a process to filter it and focus on what matters we can simply suffer from information overload. This can be bad for investors as when faced with more (and often bad) news we can freeze up and make the wrong decisions with our investment as our natural “loss aversion” combines with what is called the “recency bias” that sees people give more wait to recent events which can see investors project recent bad news into the future and so sell after a fall. A 1997 study by US behavioural economist Richard Thaler and others showed that providing investors in an experiment "with frequent feedback about their [investment] outcome is likely to encourage their worst tendencies...More is not always better. The subjects with the most data did the worst in terms of money earned." Thirdly, there is explosion in media outlets all competing for your eyes and ears. We are now bombarded with economic and financial news and opinions with 24/7 coverage by multiple web sites, subscription services, finance updates, dedicated TV and on line channels etc. And in competing for your attention, bad news and gloom naturally trumps good news and balanced commentary as “bad news sells.” So naturally it seems that the bad news is “badder” and the worries more worrying than ever. The Illuminati (are those guys still around?) are supposedly behind the “global financial crisis 2016-2017”. But you don’t even have to Google them – they just seem to pop up once it’s known you are into matters financial. I seem to constantly see an ad about why an Australian recession is inevitable in 2016 and how to protect my wealth…but they also told me it was inevitable in 2015 and 2014? The trouble is that there is no evidence that all this noise is making us better investors. 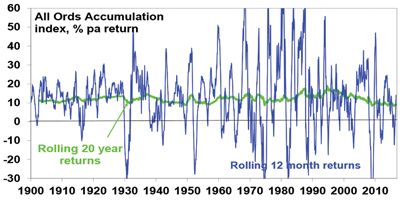 Average returns are no higher than in the past. A concern is that the combination of a massive ramp up in information combined with our natural inclination to zoom in on negative news is making us worse investors: more fearful, more jittery and more short term focussed. But of all of these, number 5 - or turn down the noise on the information flow around us, is critical - if you can't do that there is no point getting advice, you won't be a long term investor, you won't get the benefit of compound interest, you will be sucked into selling low in every cyclical downturn, etc. Firstly, put the latest worry list in context. Remember that there has always been an endless stream of worries. Here's a list of the worries of the last four years that have weighed on markets: the fiscal cliff; Cyprus; Fed taper talk; the US Government shutdown and debt ceiling debacle; Ukraine; IS terror threat; Ebola; deflation; Greece; China worries; Australian recession, property & banks; Brazil and Russia in recession; energy producers defaulting; manufacturing slump; Trump; worries about the Fed raising rates; soft starts to the year for US growth; falling profits; Brexit and contagion to the rest of Europe; North Korea; messy Australian election result; and South China Sea tensions. Yet despite this extensive worry list investment returns have actually been okay with average balanced growth superannuation funds returning 9.6% pa over the last four years and 7.4% pa over the last three years after taxes and fees. The global economy has had plenty of worries over the last century, but it got over them with Australian shares returning 11.6% pa since 1900 and US shares 9.8%pa. Secondly, recognise how markets work. A diverse portfolio of shares returns more than bonds and cash long term because it can lose money short term. As can be seen in the chart below while the share market can be highly volatile in the short term it has strong returns over all rolling 20 year periods. And invariably the short term volatility is driven by “loss averse” investors projecting recent events into the future and so causing shares to periodically from long term fundamental value. 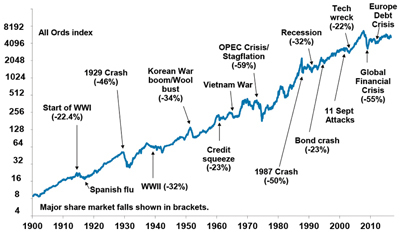 So volatility driven by worries and bad news is normal. It’s the price investors pay for higher longer term returns. Thirdly, find a way to filter news so that it doesn't distort your investment decisions. For example this could involve building your own investment process or choosing 1-3 good investment subscription services and relying on them. Or simpler still, agreeing to a long term strategy with a financial planner and sticking to it. Ultimately it all depends on how much you want to be involved in managing your investments. Fourthly, make a conscious effort not to check your investments so much. If you track the daily movements in the Australian All Ords price index, measured over the last twenty years it has been down almost as much as it has been up. See the next chart. It’s little different for the US S&P 500. So day to day it’s pretty much a coin toss as to whether you will get good news or bad. By contrast if you only look at how the share market has gone each month and allow for dividends the historical experience tells us you will only get bad news 35% of the time. Looking only on a calendar year basis, data back to 1900 indicates that the probability of bad news in the form of a loss slides further to just 19% for Australian shares and 27% for US shares. And if you can stretch it out to once a decade, again since 1900, positive returns have been seen 100% of the time for Australian shares and 82% of the time for US shares. The less frequently you look the less you will be disappointed and so the lower the chance that a bout of "loss aversion" will be triggered which leads you to sell at the wrong time. Try to avoid looking at market updates so regularly and even consider removing related apps from your smart phones & tablets. Finally, look for opportunities that bad news and investor worries through up. Always remember that periods of share market turbulence after bad news throw up opportunities for investors as such periods push shares into cheap territory. I read recently an opinion piece claiming that behind most financial scare stories is an economist. Perhaps - although I tend to think the exaggeration bit comes mostly from others. But my long term experience around investing tells me that it’s far more productive to lean into prognostications of financial gloom because most of the time they are wrong and end up just distracting investors from their goals.